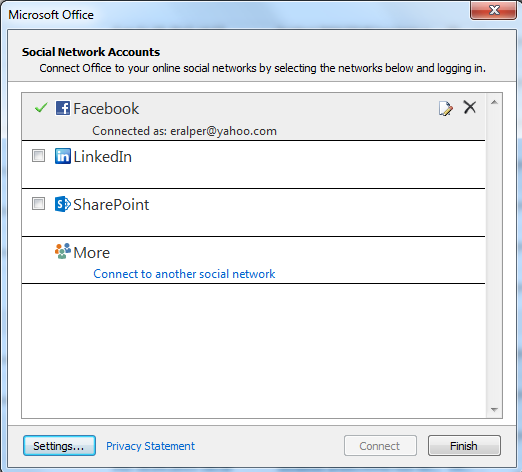 Outlook Social Connector enables you to connect to social network sites like Facebook and LinkedIn from Microsoft Outlook and view your contacts profile, status and posts on social networking websites. Microsoft Outlook users can stay up to date with the status of their friends from private life, or colleagues from office or either contacts from web if they use the same social network site and of course if the Outlook related social connector is enabled on the Microsoft Outlook messaging tool. 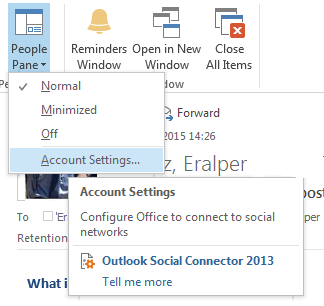 One last note about Outlook Social Connectors, unfortunately LinkedIn, Facebook, and other apps for Outlook Social Connectors are no longer supported. Please visit support.office.com for more detail on Outlook Social Connector for various social networks. 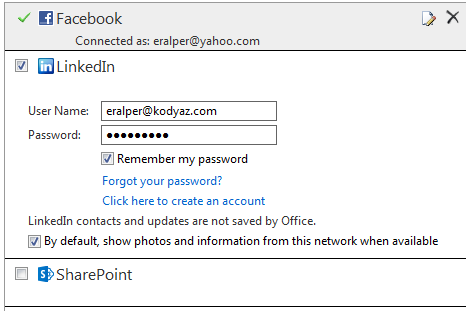 Right now, I can connect to networking sites Facebook, LinkedIn and Sharepoint web sites from my Microsoft Office Outlook 2013 using the Outlook Social Connector. Update from social networks about your contacts are displayed at the bottom part of the reading pane and it is minized by default. Following is the normal view where the Facebook profile updates and posts are displayed. In normal view of People pane, not only posts from social network are displayed. But also previous emails, Microsoft Lync conversations are also listed to view your messaging history all in one place. People pane is formed of following tabs grouping conversation history into seperate tabs enabling the Outlook user to find what he or she is looking for faster. People pane has tabs named: All, What's New, Mail, Attachments, and Meetings. All these tabs have different functions and features for Outlook users. Outlook collects profile updates and social network status while it is working. 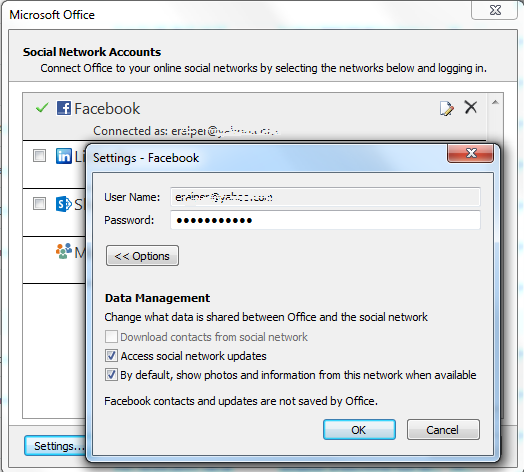 To add Facebook social network as a source for the Outlook Social Connector and add your contacts from Facebook to follow their updates within Outlook, you have to provide your Facebook credentials first. 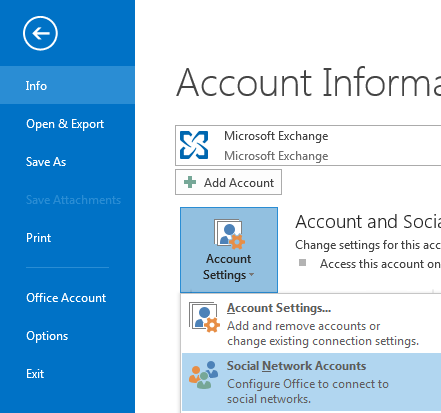 You can display the Account Settings page either from People Pane Account Settings as described above, or using the File > Info > Account Settings > Social Network Accounts selections. Mark Facebook, enter your email address and password you used during Facebook registration. Then press Connect. When authorization is successful you can close the screen by Finish button. To enable Outlook Social Connector for LinkedIn, switch to View tab then click to People Pane. Press Account Settings. If LinkedIn is not active as a social network source for your contacts activities, it will be unmarked. Mark LinkedIn if you want to activate your LinkedIn account for Outlook Social Connector and get updates from your LinkedIn contacts. Enter your LinkedIn username (registered email address) and your LinkedIn password for authorization. You can mark "By default, show photos and information from this network when available" checkbox which is not marked by default. Then press Connect button.